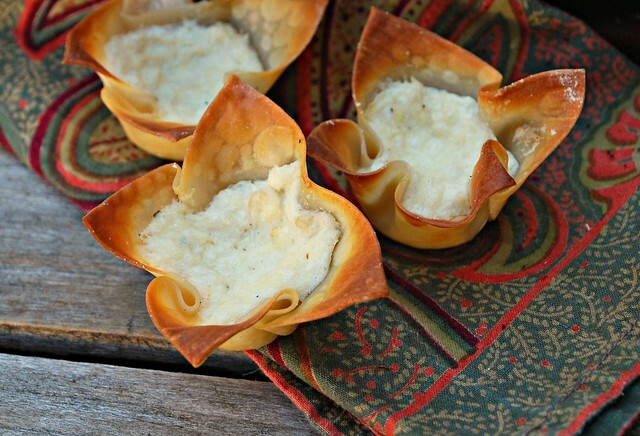 Need a quick and easy appetizer for Christmas? Here it is. I love crab rangoon! Don't you? Oh I forgot there are a few of you who don't like seafood, so this recipe probably doesn't do it for you. Sorry seafood haters (or those of you with an allergy). Lord, I couldn't imagine living in the ocean state with a seafood allergy. Must be horrible! So for those of you who are with me let me say "I love seafood!" I don't think there is a seafood I don't like. Mussels, clams, shrimp, oysters, all the fishies (although blue fish can be a bit too fishy for me sometimes), I could just live on the stuff and luckily I live in a state where the fish is plentiful and reasonably priced. Even Christmas is all about the seafood here. I'm so lucky to be born into a Sicilian family, cause that means 7 fishes on Christmas Eve! My oldest son isn't really a seafood lover. He picks at a few things. My youngest is about the same, but they will both eat Crab Rangoon. It's got to be one of the most popular dishes on the menu at your local Chinese place I would assume right? Those little bundles of joy that you order from your local take-out...they got nuttin' on these babies. Crunchy on the outside and creamy crabby on the inside. Oven to 350. Spray a MINI muffin pan with nonstick spray. Combine all the ingredients in a medium bowl. Mix until combined. 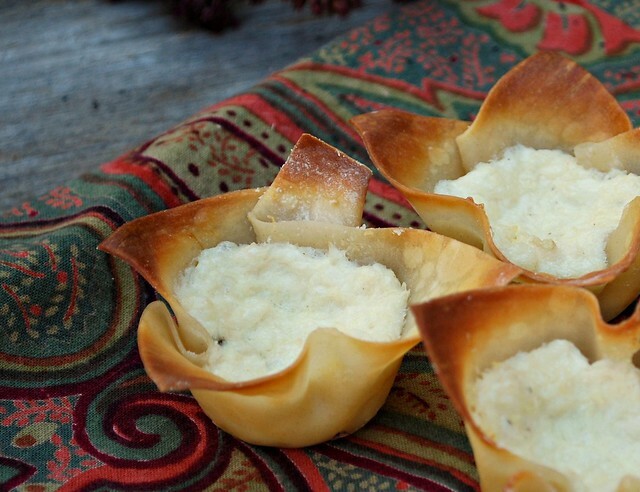 Place a wonton wrapper in the muffin cups. Push the wrapper down into the pan so it fits snugly in the bottom. Fill with about a teaspoon of the mixture. Bake 15 to 20 minutes, or until edges are golden and crisp and filling is heated through. Garnish with extra chives if you’d like. Great!! Love these and the simpler baking method. I LOVE crab ragoon. Baking them makes me feel a lot less guilty about eating that cream cheese. Yes, please. It would go well with an icy cold cocktail- or two. I love crab rangoon! These look delicious! So cute. I was thinking of making these next week for a hors d'oeuvre potluck. The host is allergic to garlic so no one is bringing dishes made with garlic. These would be perfect for me as they're make ahead (I assume), easily transported, and from the looks of it - tasty! But Siracha has garlic. Can you think of any other ingredients that can be subbed for it? Also do you think, if made ahead, would the bottoms get soggy from the filling? I would just omit the siracha. I did and they came out great. I think te baking process will eliminate any sogginess. Hope they turn out great. Let me know!